In the summer, the theater is always crowded with people. That is because many movies are released during the summer vacation. This year, many movies of various genres were released during the summer, as well. Especially, this year, the sequels to the series that many people had been waiting for have been released. So, The UOS Times will introduce some movies. Ant-Man and the Wasp is the sequel to Ant-man from three years ago and is the eighth movie of Marvel Cinematic Universe (MCU) phase 3. 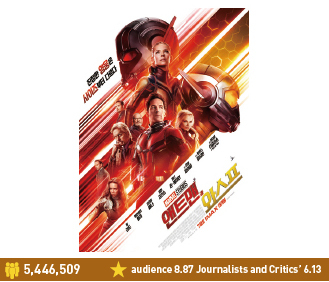 This movie has attracted a lot of attention from audiences around the world with Marvel's new female hero, "Wasp" and the most powerful female villain, "Ghost". So, this movie has been the talk of the town even before its release. The film revolves around the story of “Ant-man,” who has been hiding and agonizing between his two roles: hero and the head of the household since the civil war, and his new female partner “Wasp.” In front of them, a mysterious woman villain “Ghost," appears and shows thrilling actions while chasing and chasing each other. The film also shows the unique and attractive humor of Ant-man. It has two credit cookies, which are very important and closely related to Marvel’s next movie “Avengers 4”. So, you must stay in the theater until the movie is over. The UOS Times enjoyed watching this film. Ant-man’s humor is really our cup of tea. Some scenes were so funny that some reporters did not stop giggling. The unique action that only Ant-man and Wasp could do was so fresh and thrilling. Also, the new female hero Wasp’s outstanding performance was very interesting. However, the story and character setting of the villain were a bit disappointing, because the acting of the villain with the Ant-man and Wasp lacked probability. ncredibles 2 is the sequel to The Incredibles: An animated masterpiece that represents Pixar. Because it was a sequel to the first movie from 14 years ago, many people waited for the film with high expectations even before its release. While hero activities are still illegal, the superpower family has lost support from the Hero Social Adaptation project and is shunned by the public, as public opinion has deteriorated after the invasion of Underminer. Meanwhile, with Winston Deaver's suggestion, Elastigirl is active as a hero and draws attention to the world. While she is gone for her hero activity, the rest of the family has difficultly with everyday life. And the worst villain, Screenslaver appears in front of them. The crisis-stricken superpower family shows fantastic team work to defeat the villain. Unlike other hero movies, this film revolves around the story of a superpower family. Not only does it show the fantastic super abilities of them, but also deals with the real livelihood of the family. It is not just about money. The film depicts everyday family problems that most people can empathize with, like trial and error as a parent, a collision of children’s adolescent self, an uncontrollable baby. 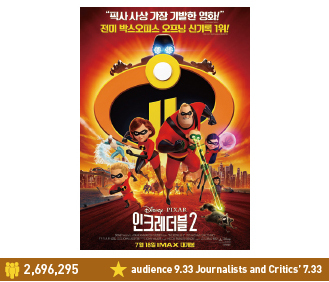 After watching the movie, baby jack-jack was the most memorable. Maybe, The UOS Times is not the only one who was fascinated by jack-jack’s cuteness. And The UOS Times also loved the dramatic action scenes. It was thrilling. But most reporters felt the villain was a little bit boring. Because the villain was predictable and not strong enough. Herstory is based on a true story of the Gwanbu-trial. The Gwanbu-trial is a lawsuit demanding a formal apology and compensation from the Japanese government. Ten Japanese Military Comfort Women and Japanese military sexual slavery victims filed the lawsuit. It was named because it was conducted between Busan and Shimonoseki. It lasted from 1992 to 1998. This trial is significant because it was the first time in the history of the Japanese Military Comfort Women trials that the victims received some compensation. But it has been forgotten in history without being properly known. 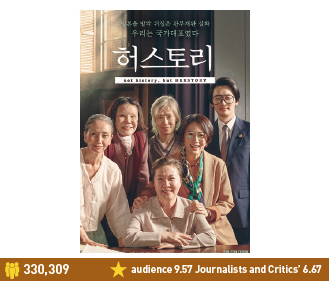 While working on several scenarios for the Japanese Military Comfort Women, the director found the story new and was convinced that he could find a narrative of will that we would never forget. With such confidence, he immediately started to produce the film. The director expressed the meaning behind the title, saying, "I wanted to deal with the vivid pain of individual women through the history of women writing their own voices." The slogan "not history, but Herstory’ is also synonymous with the title. The UOS Times was really touched by this film. That is because it delivered a real human story of each of the Japanese Military Comfort Women without being provocative. The calm storytelling of this film made the reporters who watched this movie cry and feel a lot. It was a story that we must not forget, so The UOS Times hope we all watch this movie and care about our painful history. Along with the Gods: The Last 49 Days is the sequel to Along with the Gods: The Two Worlds and based on a popular webtoon. Because the previous film was very successful, and it is a rare genre in Korea, people have been waiting for this film. 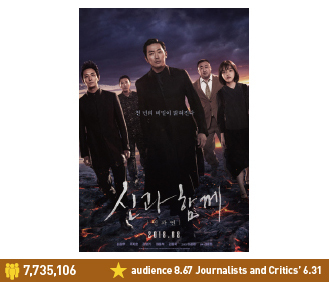 In the other world, Kim Su-hong, who was the evil spirit of the first film, became the protagonist of the last 49th trial and carries on a trial with Gang Rim. In this world, Hae-won Mac and Deok-chun, who went to pick up the dead at the command of King Yeomra, meet god Sung-joo, who even knew about their past. Their stories, complicated for a thousand years, give the audience fresh fun and are moving. Unlike the first film, the movie focuses more on the story and emotions of the characters. Therefore, people can feel the chemistry between characters more than the first movie. Also, this movie shows a colorful magnificent computer graphic as a Korean fantasy blockbuster. For me, this was better than the first one, because there were some funny humors. But overall, The UOS Times was bored with this movie. The UOS Times felt that the story and running time are too long. The UOS Times do not think we will wait for the next one. Besides the movie that The UOS Times introduced, many movies were released this summer. How about enjoying your cultural life while watching movies in the theater?